A team of archaeologists from the University of Hamburg said they discovered the Queen of Sheba’s palace and an altar that may have once held the Ark of the Covenant in Axum, Ethiopia. A Christian king built a new palace over the 10th-century B.C. structure, which probably didn’t survive for very long, the university said in a statement. The altar, oriented toward the star Sirius, has two columns and may have been where the Ark of the Covenant, the holiest treasure of early Judaism, was kept until the first temple was built in Axum, the researchers said. The Ark of the Covenant, featured in the Indiana Jones movie “Raiders of the Lost Ark,” was kept in Jerusalem for centuries, according to the Old Testament. After Jerusalem was conquered by the Babylonians in the 6th century B.C., the ark’s fate isn’t documented in the Bible and it entered the realm of legend. The Hamburg team led by Helmut Ziegert has for nine years been investigating the origins of the Ethiopian state and the Ethiopian orthodox church. The central purpose of the field trip was to find out how Judaism arrived in Ethiopia in the 10th century B.C., and to seek clues to the present location of the Ark of the Covenant, the university said. The palace built over the Queen of Sheba’s home was also aligned with the star Sirius, the statement said. 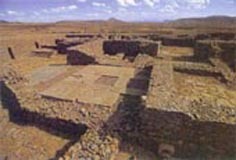 The researchers conjecture that the second palace was built by Menelik, who, legend has it, was the son of Sheba and King Solomon. The results of the Hamburg field trip suggest that together with Judaism and the Ark of the Covenant, a cult worshipping Sirius came to Ethiopia and practiced its religion until about 600 A.D., the university said. According to the Old Testament, God ordered Moses to build the Ark of the Covenant, a box made of acacia wood and plated with gold. It is believed to have contained the tablets listing the Ten Commandments…. This article only focus on the ark of the covenant!! It doesn’t give any details whatsoever about the QUEEN or her palace! This article should have been titled “The Search for the Ark.” The title was decieving and it’s obvious.